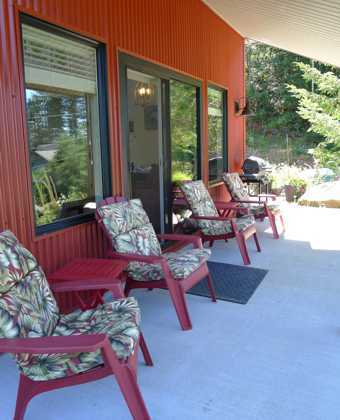 Situated on 2.3 acres at the head of Whalebone Cove in the beautiful Copper Bluffs area of Quadra Island, our 700 sq. 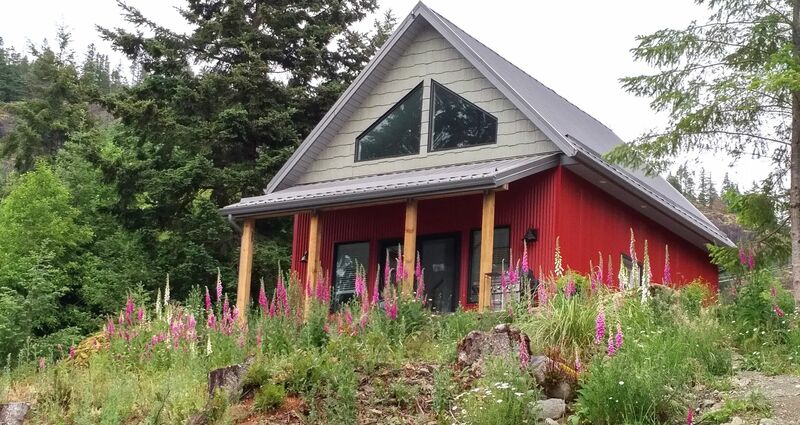 ft. cabin faces west, offering amazing views of Discovery Passage and the mountains beyond Campbell River. 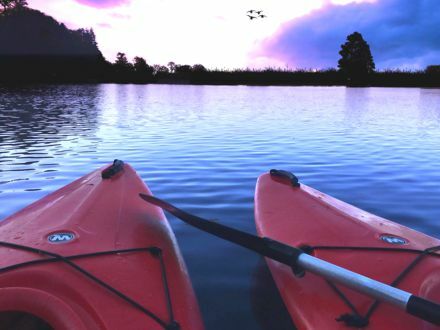 It is a short drive to Heriot Bay, Village Bay Lakes, Morte Lake, and many hiking trails, mountain bike trails and kayaking. Our 240 feet of waterfront is accessed either by a short trail on our property, by public access at Whalebone Cove Road, or best of all, via our own dock. Looking westward it's hard to find a nicer sunset on Quadra Island. 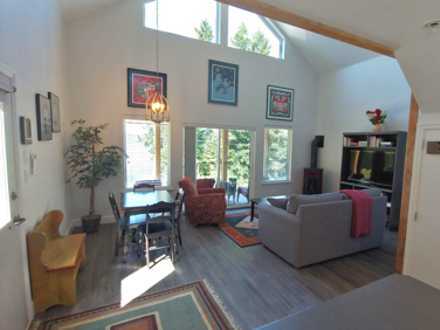 If the large front windows don't get you close enough, then just sit out on the deck and enjoy the show. You'll also love the privacy. Forget that city noise. This is the land of nature sounds, birds singing, frogs, crickets. We're also comfortably separated from Quadra's busier areas — and still close enough to slip in for a beer at the pub or to shop for your next meal. For full details on our rates and terms, please view our details page HERE. 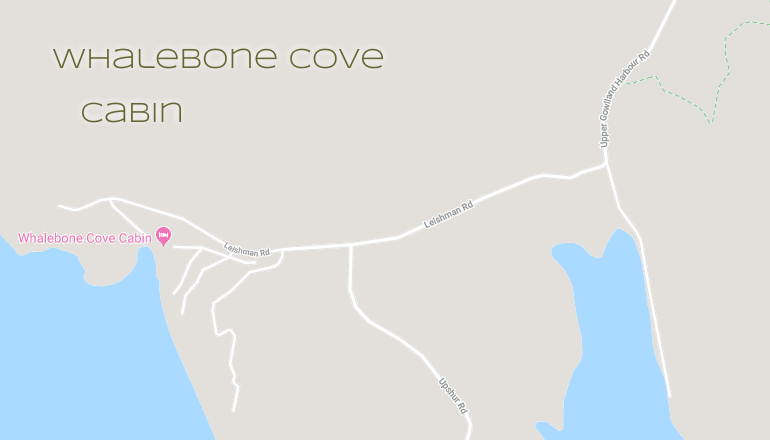 Whalebone Cove Cabin is ideal for a most peaceful getaway. 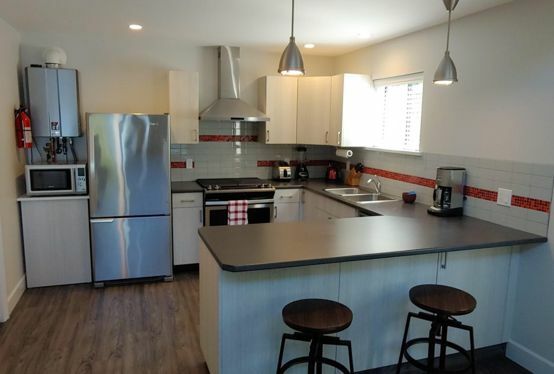 It has everything you need and then some — a fully furnished kitchen, a very comfortable queen-sized bed, clothes washer and dryer. We also provide a barbecue on the deck in case you have the urge to grill. And just to make sure you stay connected with the world, we have not forgotten a large screen TV and included the internet. Enjoy! Call us at 250-937-0212 or send a quick message using the contact form.